The Beneath Heat ‘Tacker Panel System’ has been developed to be used in combination with floor Insulation panels to provide a secure method of securing the pipes to the insulation layer below. 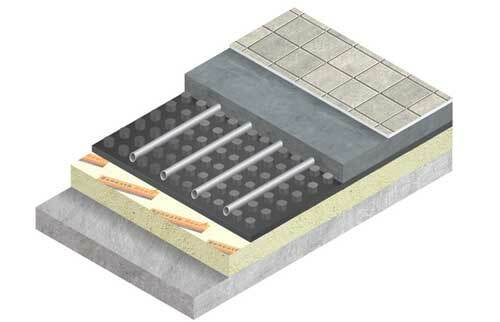 The Beneath Heat ‘Tacker Panel System’ is used for screeded floors. 1. Edge insulation is fitted around the perimeter of the heated room providing a barrier against heat loss and expansion. 3. 500 gauge black polythene is then laid over the complete area. 4. The tacker panel is laid to cover the complete floor area. 5. Beneath Heat pipework is then laid in accordance with the Beneath Heat design provided. Pipe is secured to the layers below with the rail in combination with staples. 6. Beneath Heat pipework is connected to the manifold, filled & tested in preparation for screeding.